Mix yeast with warm water in a large mixing bowl and allow to stand until a creamy layer of foam appears, about 10 minutes. Whisk in 1/4 cup olive oil, then gradually stir in flour and 1/2 teaspoon kosher salt. Coat a 9x13-inch baking sheet generously with 2 tablespoons olive oil; place dough in the center of the baking sheet and flatten into a thick disk. Cover dough with plastic wrap and let double in size, about 1 1/2 hours. Use your palms and fingers to gently press and stretch dough to the edges of the oiled baking sheet, making the flatbread as even in thickness as you can. With fingertips, make small indentations in the dough. Brush dough with remaining 2 tablespoons olive oil. 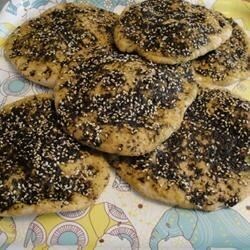 Stir za'atar and 3/4 teaspoon kosher salt together in a small bowl and sprinkle evenly over the flatbread. Let dough rest for 30 minutes uncovered.